Every now and then, a book comes along which changes your life. For me, Roberto Calasso’s The Art of the Publisher is one of them. But you don’t have to be – or, like me, want to become – a book publisher to find this gem an inspiration. For quite a while now, publishing has been steeped in a pervasive atmosphere of gloom and doom, especially in South Africa. The threat of the internet, the e-book, the retail giant Amazon, and the financial crisis have made life for the printed book difficult. Locally, a seemingly general disinterest in South African fiction and foolish political decisions have made survival tougher for our publishers, and consequently, of course, for us writers. Book sales are not encouraging. Publishers scaling down even less so. Yet, watching developments like the self-publication of Paige Nick’s latest novel, Death by Carbs, or new publishing ventures like uHlanga and Tattoo Press, I have a feeling that some creative and daring people in the country are on to something which gives me many reasons for optimism. Roberto Calasso’s essays collected in The Art of Publishing attest to the fact that it all comes down to basics. And the basics are vision and quality. It is these two aspects of publishing that readers throughout centuries have best responded to with enthusiasm. These are no trade secrets, just simple rules which those who have been successful in publishing have always followed. Critic, writer, and a publisher himself, Calasso has been at the forefront of Italian publishing for decades. His love for literature and the book shines through every single paragraph of The Art of Publishing. His passion is one of beauty. His insights are heartening to read. He goes into the fascinating history of publishing, asks what constitutes culture, celebrates the great publishers of our times, explores the relationship between the publisher and the writer, demonstrates how crucial the nourishment of writers and the care for the book as an object are to a thriving publishing environment, and most importantly, to our intellectual and emotional lives. Calasso also shows that even if often unbeknownst to us why a particular publisher attracts our enthusiasm, as readers we understand the value of our “repeated experiences of not being disappointed.” And that is what only a publisher of vision and quality can offer. Review first published in the Cape Times, 22 January 2016. This entry was posted in What I've Read, What I've Written and tagged book as object, Book Lounge, book review, Cape Times, Death by Carbs, Italian publisher, Karina M. Szczurek, Paige Nick, Penguin Books, publishing, quality, readers, review, Roberto Calasso, Tattoo Press, The Art of the Publisher, uHlanga, vision on January 22, 2016 by Karina. This is not a review, just a Fan Letter of Admiration Addressed to You in Public. I became aware of somebody called Nick Mulgrew about one-and-a-half years ago, perhaps two. The name definitely stuck by the time I read his award-winning story “Turning” in Adults Only. I knew about his connection to the literary magazine Prufrock, heard that he wrote poetry. Then earlier this year, I got involved in Short Story Day Africa (SSDA) and met Nick in person. First impressions: fiercely intelligent, funny, unassuming. Young. We were entrusted with co-editing Water, the third SSDA collection of stories. The anthology includes twenty-one pieces from across the continent, among them this year’s finalists and the winner of the competition (still to be unveiled). We began the task and my first impressions of Nick only intensified. Multi-talented, wise, and sensitive were added to the list. He was a revelation to work with. Punctual, understanding, and extremely cooperative. What seemed like a daunting task, turned out to be pure inspiration (I learned so much from Nick!). We also had a fantastic selection of writers to work with. And the stories! I can’t wait for readers to dive into Water. You will find some absolute stunners in there. With SSDA, Rachel Zadok set out to give prominence to the versatility of storytelling in Africa. She was adamant that it’s not all gloom and doom. Water proves it unreservedly. A while back, Nick embarked on another literary adventure by becoming the editor of uHlanga, the hottest poetry publisher on the block, with three debut collections out this month. His among them: Genna Gardini’s Matric Rage, Thabo Jijana’s Failing Maths and My Other Crimes, and Nick’s the myth is that we’re all in this together. I got it yesterday at Sindiwe Magona’s launch of Chasing the Tails of My Father’s Cattle (published by another newcomer, Seriti sa Sechaba Publishers) at The Book Lounge. Before bed, I wanted to dip into it and ended up ditching Jack for the entire collection. Unputdownable. 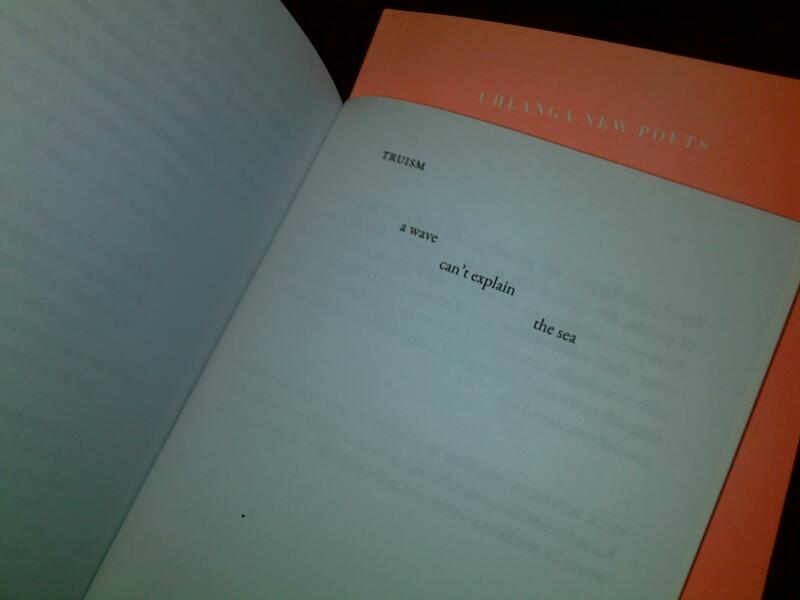 Before I buy a poetry book, I have this weird test. I find one or two short poems in the volume and if I like them, I buy it. If there aren’t any, the first few lines I turn to have to be bloody good to make up for the lack of short gems. 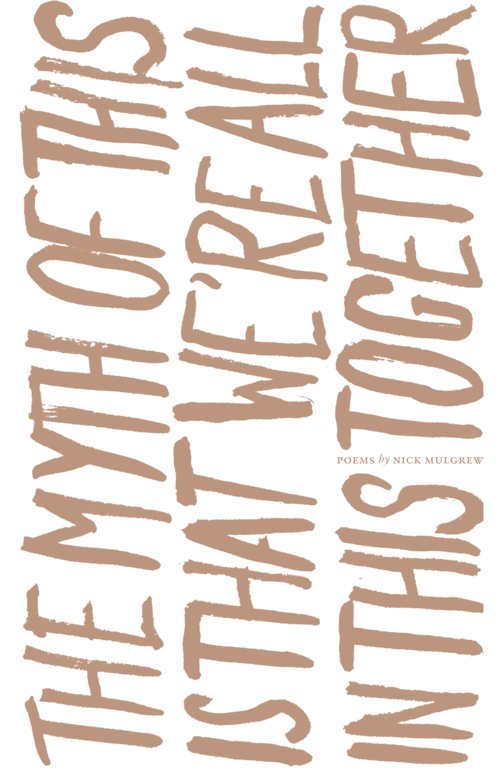 Nick’s the myth is that we’re all in this together opens and ends with few-liners. And even the dedication is a poetic gesture of note. I won’t spoil the fun for poetry lovers and tell you what it is, or why the titles of the individual parts of the collection made me smile. I love its sublime simplicity which says everything about the power of poetry, because, naturally, just as the sun and the sky are never the same to the perceptive observer, every word in a poem in the hands of a true poet is a revelation, every time. Or watch the seeming ‘blah, blah’ of the first lines of “feature pitch” turn to “… whether it’s expression or provocation / or minesweeping for echoes in this confluence / of galaxies, or inside the thoughts of another person, / one who sits at their computer at seven-thirty … nursing small sadnesses”. Or the ease of “on watching Notting Hill for the thirteenth time” which ends with “aware giddily of his own unawareness”. Or the maturity of “testament”: “a recipe to give to a child who / in a few years might be someone like me / but in many ways better”. Or the devastating truths of “first readers”, a poem anyone who had their intellectual and physical property violated will relate to. There are the intimate moments of poems like “eyebrows” (“as you look / and kiss / in all those places that / no one really looks at”) or “a June missive” (“you / were alone as I was”), and the social consciousness of others like “barrier” (“things that would be small knowledge / that would make me morally obliged / to learn small things about him too”) or “Boxer Rebellion” (“… but really this world is too / vast, this past too deep, for us to / ever really know anything about / each other ever”). At the core of it all are language and our ability to mis/communicate, especially now in the digital age that is revolutionising what it means to be human in a world of global calamities, fraught with the insanity of the everyday. He is. And he is only 25. I mean, like, really!? This entry was posted in Comments, What I've Read and tagged Adults Only, anthology, Chaising the Tails of My Father's Cattle, Failing Maths and My Other Crimes, Genna Gardini, Matric Rage, Nick Mulgrew, poetry, Prufrock, Rachel Zadok, Seriti sa Sechaba Publishers, short story, Short Story Day Africa, Sindiwe Magona, SSDA, Thabo Jijana, the myth is that we’re all in this together, uHlanga, Water on November 11, 2015 by Karina.